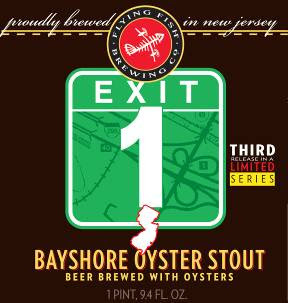 The Bayshore Oyster Stout is part of a limited series named after the exits on the Jersey Turnpike (Oyster Stout represents Exit 1). I've never had anything from the Flying Fish Brewing Co., but I'm going to keep them in mind. The concept of a beer brewed with oysters is a bit bizarre. Would people with shellfish allergies be able to consume this beer? Is the oyster like a tequila worm, waiting at the bottom of the bottle? Is this going to taste totally gross? Good news - no visible oysters in my beer, and the taste is actually quite good. The flavor and feel of this beer is definitely the highlight. There is a very nice maltiness, with a creamy and smooth feeling on the tongue. The aroma of smoked malt is pervasive, as you'd expect. Basically, this is a very smooth and creamy stout. I get a minor hint of salt, but I really have to think about it to notice. The creaminess successfully hides the 7.0% ABV. Oddly, I'll be reviewing another Oyster Stout next week. I received two as gifts recently, having never had an oyster stout.